Hello, sad about the butterflies being hit, but it does not seem preventable. 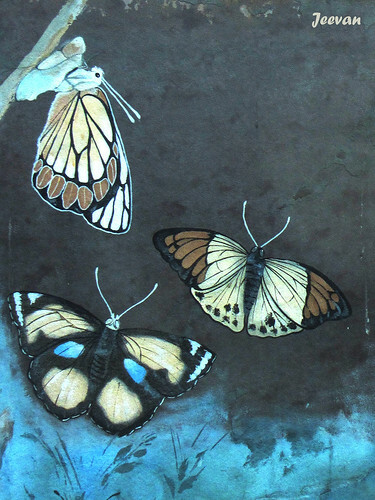 The rock painting of the butterflies is beautiful. Thank you so much for linking up your post. Happy Sunday, enjoy your new week ahead! It is amazing and strange to know that there were lots of butterflies on your highways. There must be lots of pretty flowers lining the highway there. You could say small prayers to ferry the butterflies' souls when they got knocked. It would help end their karmic cycles faster. Such pretty ones. Here we rejoice if we see four or five! It is good to see such cute species around, I wish there was a way we didn’t knock them down! Lovely rock painting -- but shame about the butterflies crashing in to cars. Very pretty rock painting of butterflies. Its sad that the butterflies flew into the path of fast moving vehicles on the highway.